On Thursday, Wave VIII goes on sale at retailers throughout the United States. In a few short days you will have your chance to battle for the fate of the galaxy with the Ghost and the protagonists of Star Wars Rebels. Alternatively, you can hunt the Rebels down with the Inquisitor and his TIE Advanced prototype, or you can pursue whichever prey is most lucrative, calling upon the services of three of the galaxy's most notorious bounty hunters, Zuckuss, 4-LOM, and Dengar. The starships from X-Wing Wave VIII, including the previously released T-70 X-wing and TIE/fo fighter. 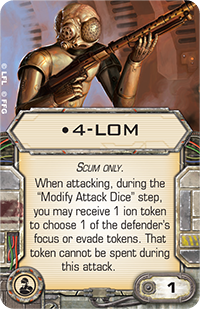 Over the past weeks, we have taken a closer look at all the Wave VIII expansion packs and their contents. 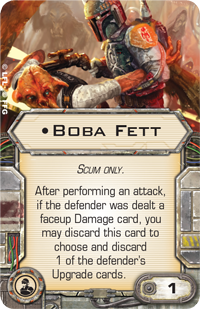 We learned about World Champion Paul Heaver's intentions with the Boba Fett upgrade card. We even saw the early release of the T-70 X-wing Expansion Pack and TIE/fo fighter Expansion Pack, which were added to Wave VIII last September. Now, as we look to pass the final days and hours of our anticipation, we offer an interview with the game's developers. What happens behind the scenes of X-Wing? How do the developers decide which ships to make? What steps do they follow to create them? Developers Frank Brooks and Alex Davy tackle these questions and others. 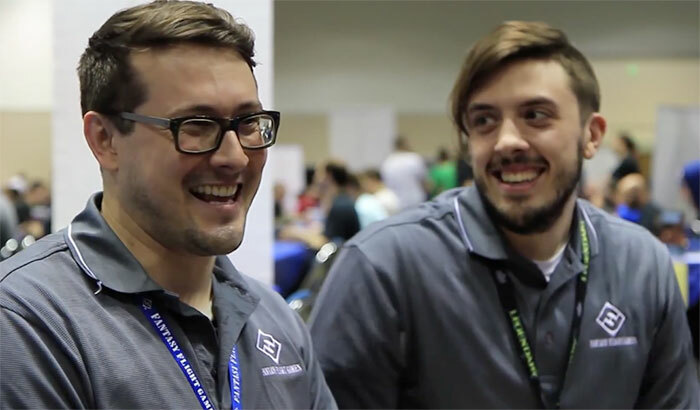 Alex Davy (left) and Frank Brooks (right) share a laugh during the 2015 X-Wing North American Championships at Gen Con Indy. 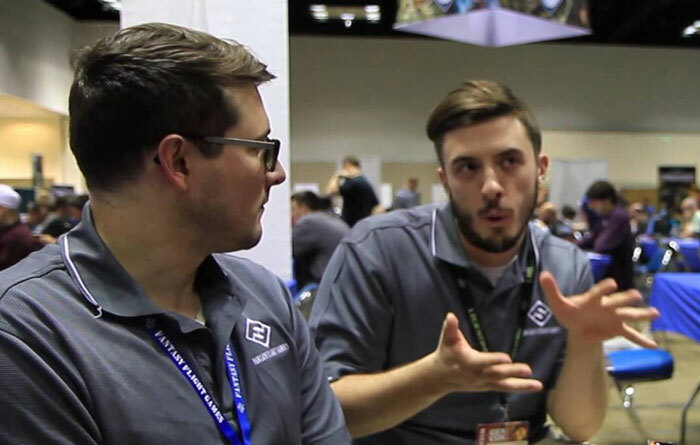 FFG: Thanks for meeting with us, guys! I know you're both busy, so let's dive right into the heart of the matter. 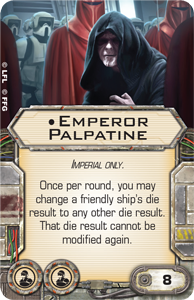 How did you guys decide which ships to release in Wave VIII? Alex: After Wave VII, we were getting close to getting Scum onto an even level with the other factions. We knew we wanted to finish up the bounty hunters from The Empire Strikes Back and their signature ships. With the Rebels and the Imperials, we wanted to create the ships from Star Wars Rebels as it had just come out, and we were stoked to be able to work with them so close to their addition to the intellectual property. 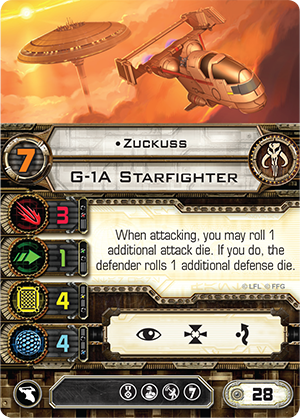 FFG: Once you had the ships selected, how did you then go about deciding what they would look like in terms of stats, upgrades, maneuver dials, and other game elements? Alex: That's the question, isn't it? We always start by analyzing the source material and trying to create an in-game profile of the ship that matches its canonical capabilities. Frank: If those capabilities are debatable, or if the details are scarce, we may drift the design toward a ship that the faction needs. In Wave VIII, we took what we knew of the Mist Hunter and used it to fill a "heavy fighter" role that the Scum didn't really have yet. A 360-degree view of the Mist Hunter. Alex: The big thing for the wave was to get the look, feel, and mechanics of the Ghost right. It was lucky we had an entire season of the show to base our design around! Even so, I would like that show's creators to know it was not easy to translate their ships into mechanical designs for the X-Wing Miniatures Game… though it was a lot of fun to work on such a wild ship design! 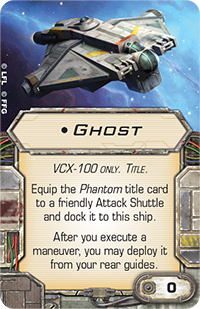 FFG: What made the Ghost so challenging? Alex: The Ghost is just a crazy ship. It has fore guns, a dorsal turret, and a dockable attack shuttle that also functions as the vessel's rear guns. Turning all of those moving parts into something that would be fun in the game was a fascinating challenge. A 360-degree view of the Ghost. Click here to view a larger image. 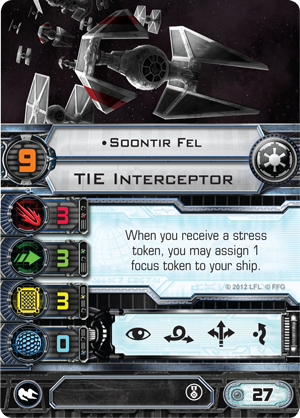 FFG: How often would you say you feel challenged to translate a ship's features into game mechanics? 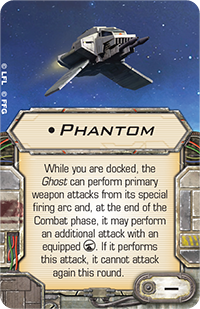 Frank: The TIE phantom's cloaking ability and the K-wing's SLAM ability were definitely wacky abilities. Docking the Ghost and Phantom was another good example of a crazy effect that we wanted to capture in the game. Alex: Anytime there's an interesting, unique aspect of a starship—like SLAM, cloaking, tractor beams, etc.—we work really hard to incorporate it into the game. And we try to make sure it opens up new strategic avenues for players to explore. Tractor beams took a long time to implement properly, but I'm really excited for how they're going to shake up the game. Frank: We had actually been throwing around ideas for the Tractor Beam as far back as Wave IV. 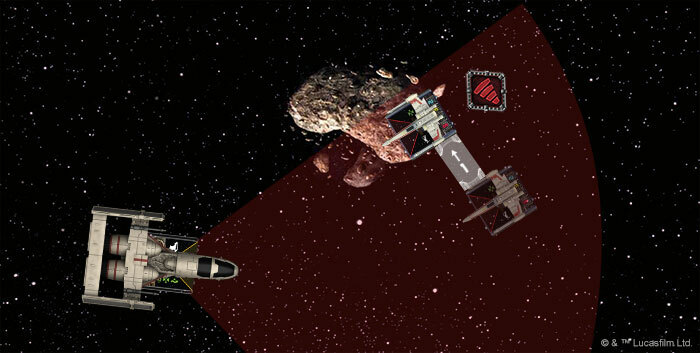 The TIE Defender originally had one, but we really needed to make sure cloaking felt right. That meant that tractor beams took a bit of a back seat until we could have more time to invest into incorporating them into the game in a way that really felt right. Also, if we had added both tractor beams and cloaking in the same wave, it would have been a lot to process all at once. I'm glad we waited. FFG: As far as getting things right goes, how do you know when you have something right? Alex: Part of it is feedback. Part of it is instinct. 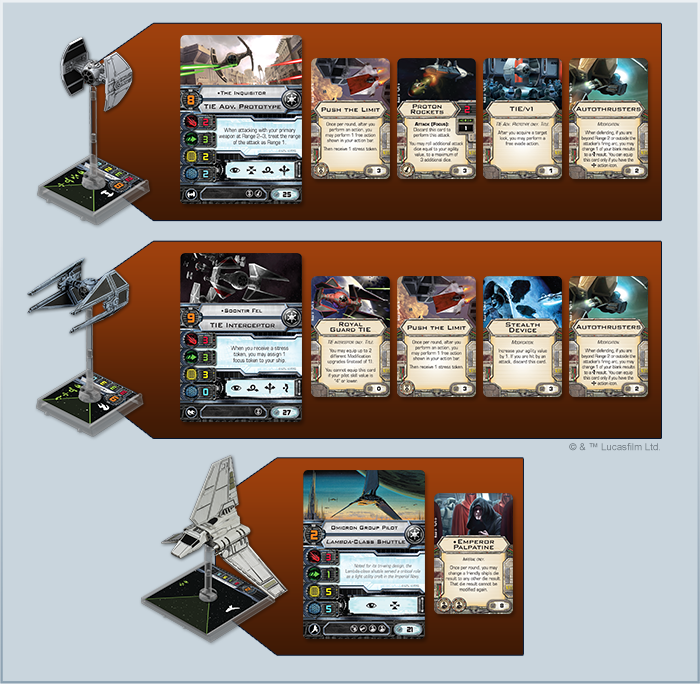 We definitely test all new content against powerful meta archetypes like dual IG-2000s, Palpatine and Aces, TIE Fighter swarms, and Rebel all-rounder lists like Paul Heaver's World Championship builds. We always strive to make each new release completely viable, as well as entertaining and interesting for casual players. The cool thing about the metagame, though, is that people often take it in directions we didn't anticipate. We give them the toolbox, and what they build with it can be incredible. We definitely didn't anticipate a triple K-wing list making it into the top tables at Worlds, but it was one of the strongest lists we saw all weekend. A fully loaded Inquisitor makes a worthy addition to an Imperial build with Emperor Palpatine and Soontir Fel . Frank: Sometimes we will even make a pilot ability or upgrade card that aims specifically to disrupt or shake up the meta. Sometimes it works, sometimes it doesn't. 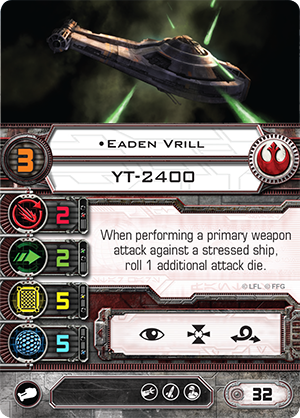 Eaden Vril was supposed to counter ships that intentionally stress themselves, but he hasn't really seen a ton of play for this effect. Alex: On the other hand, Autothrusters worked exactly as intended and breathed new life into the TIE interceptors. FFG: I know that the tournament audience for X-Wing is massive, but the majority of players are still casual players who prioritize fun ahead of efficiency. What sort of measuring sticks do you have in place to make sure that the ships and upgrades focus on "fun"? Frank: Wave VIII, specifically, I think it was really fun to have the combos between 4-LOM crew and Zuckuss pilot and 4-LOM pilot and Zuckuss crew. They both have different ways to play off the themes of those abilities. 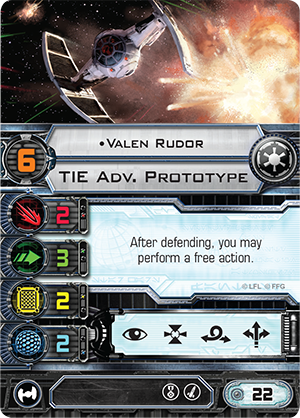 Another one is Valen Rudor 's ability; it makes your opponent have to think a little differently about when the best time to attack him is. If you attack him too early in the round, he might be able to barrel roll outside of the firing arc of another ship that you would rather have make the attack. I feel that any ability that makes your opponent have to think about his or her game plan differently is fun for both players. Alex: To me, the heart of this game is—and has always been—maneuvering. It's what separates X-Wing from other miniatures games, and it's what gives the game its dogfighting feel. It's a big part of what makes the game fun. Game elements that directly impact how you deploy and maneuver are like little puzzles that you try to solve on the tabletop, even while you and your opponent are trying to blow each other up! 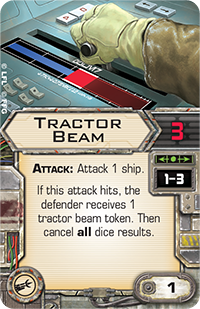 The Tractor Beam cannon from the Mist Hunter Expansion Pack offers you one way to force strange maneuvering situations upon your opponent's small-base ships. Frank: One thing we started to focus on more with Wave VIII was the idea of turret ships that care about arcs. That reinforces the emphasis on maneuvering. 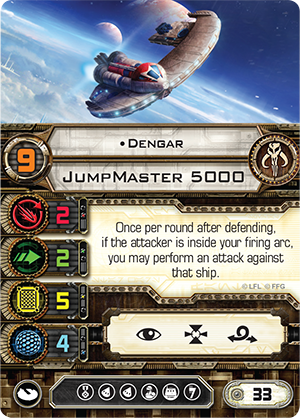 Dengar , for example, is one of the first turret pilots to worry about his firing arc. Designs like his might even provide a shift in the meta. Using turret ships to run away and fire from outside of arc won't always be as desirable in the future. FFG: Dengar versus TIE interceptors with Autothrusters definitely feels like a match in which the turret player cannot afford to fire outside of arc all the time. How did your playtesters respond to those match ups? Frank: Players really enjoyed having to make turret ships worry about getting ships in arc. 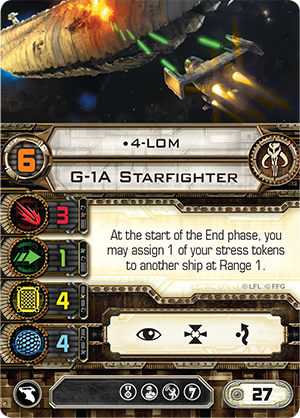 FFG: I know they are all your babies, but do you have any favorites among the ships and upgrades in Wave VIII? Alex: I love a lot of things in Wave VIII, but I'm all about bounty hunters. Always have been, always will be. I think Dengar, Zuckuss, and 4-LOM will shake things up in a big way. I'm also really excited to watch Paul Heaver's Boba Fett hit the metagame like a thermal detonator. That card was a blast to collaborate on. Overall, though, I love the Ghost and the Phantom. It's a wild Swiss Army Knife of a ship, and on top of the opportunities it offers competitive players, it's going to be a real boon to the players designing missions on the X-Wing Mission Control. Frank: My favorite ship from Wave VIII is definitely the Punishing One. First of all, it's called the JumpMaster 5000! How great is that? CamelCase and everything. Second, I have been wanting to have a ship that has an asymmetrical dial. In real life aviation, not every ship is perfectly capable of making any maneuver. The asymmetry of the ship design just means that it would naturally not be able to turn to the right as well as it can turn left. 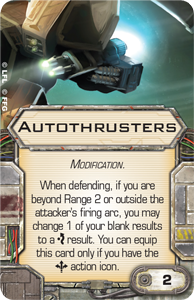 Its thrusters are not behind its center of balance. The ship would have to bank or flip in order for it to be able to turn the other way. I am so glad that the asymmetrical dial made it into the final version of the ship. It will be fun for players to try to predict their opponent's moves knowing that it has a preference for how it maneuvers, and it creates interesting decisions for the player flying the JumpMaster that start as early as setup. A 360-degree view of the JumpMaster 5000. Click here to view a larger version. FFG: Okay, just a couple more questions. How often do you follow the players' responses in the forums? And were you surprised by anything you saw in response to Wave VIII? Alex: I love reading the FFG X-Wing forums after a preview article has been posted. It's a very involved and passionate community, and it's great fun to watch the discussion and debate unfold, whether positive or negative. Not everything we do hits the mark, and not every player is going to love the choices we've offered. But when we actually knock it out of the park, it's hugely thrilling. Frank: I, too, enjoy going on the forums. I love seeing people's (sometimes hyperbolic) reactions to the things we finished months prior. I enjoy seeing people light up and explode with words of excitement when they learn of a new card that will boost their favorite ship or when they learn their favorite ship is finally going to get into X-Wing. 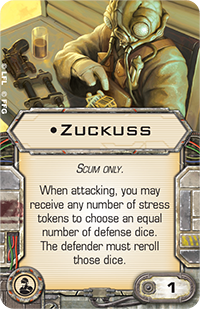 FFG: Did you see the Downfall meme that one of the users posted after the Punishing One preview? Alex: Ha! Yes! And it's not the first Downfall meme that's been done for X-Wing. All Pilots to Your Ships! Our long-range scanners have picked up enemy ships, and the countdown to launch has begun. Wave VIII arrives Thursday. How will it reshape your X-Wing battles?